Truck slams into larger one. A passenger in a six wheel delivery truck died this morning after the driver admitted bending down to pick up his phone. 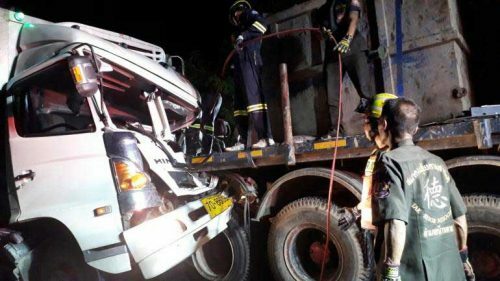 Police and rescue staff called to Pahonyothin Road heading north in Sam Ngao district of Tak found a Hino truck embedded into the back of a larger vehicle carrying a heavy load on its way to a cement factory. Already dead in the passenger seat was 41 year old Parinya Athan. It took rescuers two hours to cut him free. Driver Fer Lekkham, 52, from Tak said that he and his colleague were making deliveries for 7/11. He was travelling at a safe distance from the truck in front when his mobile phone slipped off the dashboard. He bent down to pick it up and the next thing he knew he was careering into the back of the truck. His passenger tried to move to avert disaster but it was too late – there was not even time to brake, he said. Driver of the vehicle in front Jaras Thojampa, 47, thought a tire had blown on his truck. He stopped immediately and was shocked to see the delivery truck had collided with him. It is not known what the police intend to do in the matter.